Mandee Rose | Posted on March 21, 2018 July 20, 2018 | Leave a comment on Mullvad Review 2018 – How safe is Mullvad VPN? You can follow the little mole for free and he will provide all the equipment you need to secretly tunnel across the globe. Mullvad’s owners are very strong believers in internet privacy and they created their service to protect the public from government snooping, Internet Service Provider (ISP) throttling and potential legal action. They are adamant that they keep no logs and their encryption procedures are strong enough to keep all of your activities private. 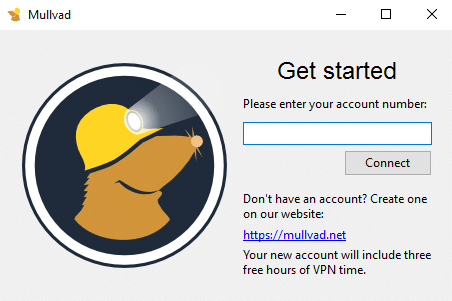 How Much Does Mullvad VPN Cost? Mullvad is based in Europe and so its charging rate is fixed in Euros. This means that the price might work out to an odd number in your local currency, depending on the exchange rate. Most VPN services offer a discounted monthly rate if you pay for a longer-term subscription, such as six months or a year. Mullvad keeps its rate at €5 per month no matter what subscription period you choose. The company’s subscription process aims to provide the maximum anonymity possible for its clients. However, you could probably be traced through the bank account you choose to pay with. If you pay with bitcoin, you improve your chances of being untraceable. You can mail cash to the company’s offices, but don’t forget to include your account number with it. You don’t have to give a name or a return address. This is a great way to remain completely anonymous. Other payment methods include PayPal and credit cards (which are processed through PayPal). You can pay with Bankgiro transfer or wire transfer. You can also transfer your payment via Swish. One more option is to buy a credit in a store or purchase an account for a friend, receiving an activation code to send on. Mullvad has 4096 bit RSA certificates for server authentication, which is un-crackable. It uses 2048 bit Diffie-Hellman keys for the actual session key exchange. This is good enough for now, but it would help to assure users if Mullvad could amp up this level of security. 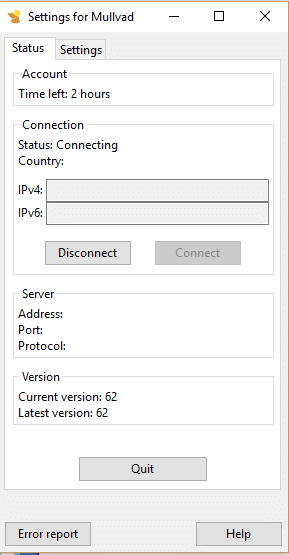 Does Mullvad VPN Keep Logs? Mullvad is based in Gothenburg, Sweden. The EU keeps trying to impose data disclosure directives. However, the implementation of these into laws is down to individual states. Some countries, such as Romania, flatly refuse to codify these requirements, while others, such as Sweden and Germany, are more inclined to toe the EU line. However, the EU’s data privacy laws contradict its data disclosure ambitions, so the actual status of digital privacy in Europe is in a constant state of flux. Mullvad states that, although it needs to keep some tracking of activities in order to provide this service, it doesn’t archive these records. Furthermore, its refusal to keep payment account details and the anonymity provided by the generated account number for client identification means that it couldn’t possibly identify the activities of individual users. Click on the “Get account” button at the top of the Mullvad homepage. Click on the words “What do you see?” and enter the CAPTCHA text. Press on “Generate account number” to proceed. Make sure you write down the account number that appears on the next page – it is too long for most people to remember. This number is the only form of identification you will need to use the account. At this point, you have three hours to use the service without paying anything. You can then choose to pay on a monthly basis in order to keep the service running. Your next task is to download the VPN client software. Click on the “Download client” button at the top of the screen. The website will detect your operating system and present a download button for it. Click on the big Download button to get the installer program onto your computer. With one click on that downloaded file, the Install Wizard will open. 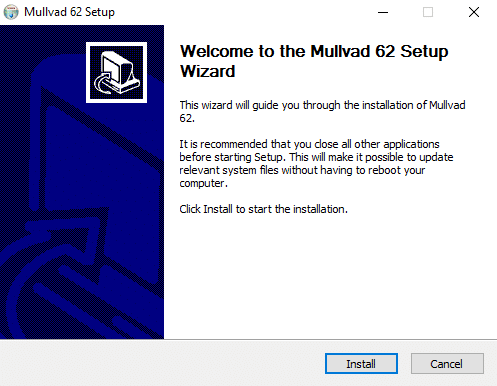 Click your way through the installation screens and make sure that the “Run Mullvad” box is checked before you press the Finish button in the last screen. This will open the application for you so you can get on with testing Mullvad before those precious three hours expire. Let’s hope that you saved that account number because you will need it to get the app working. When the client software opens after the install completes, you will be asked to enter your account identification. That done, you’re in. However, the clock is ticking. As you can see from the illustration below, by the time I got to this point, I had already frittered away an hour of my free trial. Without doing anything, I got this pop-up. So that was it, I was connected. However, I needed to check out streaming services, and I didn’t know which server I had been logged in to, so I needed to return to the settings. The server selection function is available from a pop-up list in the Settings tab of the app. The website doesn’t have a support page where you can enter a question. Instead, customer support is available via email. An unfortunate consequence of total anonymity is that services that don’t want to be able to identify you have to cut down on customer contact. If you need to email the company with a problem that specifically relates to your account, then you are going to have to give an email address to enable them to reply. The need to keep yourself untraceable also makes it difficult for any company to monitor quality of service and follow through on advice. In a way, making yourself unreachable also makes the service provider unaccountable. Thus there is a trade off in operation here. You can create a webmail account that doesn’t identify you and use that to communicate with customer support if you want to preserve your anonymity. The site does have a series of guides and these may be enough to help you solve any problems yourself. Your internet service may vary its speeds for different applications, so you may find that your streaming connections are really slow, while regular internet connections have much better speeds. Unfortunately, these variations in service are impossible to monitor. However, you can check whether the same activity on a VPN-protected line works faster or slower that it does without the VPN applied. These tests were performed using speedtest.net from a location in the Caribbean. The local internet service here is not as fast as in the United States or Europe. You may encounter speeds such as those available in this location when you travel for vacation. These speeds are lousy by international standards, but pretty good for local conditions. You can watch SD streaming services with 2Mbps. HBO only streams in HD and its website recommends that you have a line speed of at least 3Mbps in order to watch HBO comfortably. 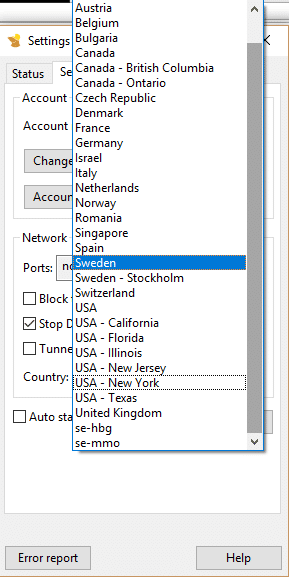 In order to dodge the regional restrictions of a streaming service, you need to use a VPN server in the same country as the video site. I chose the Mullvad server in Florida and started the speed test on a connection to Miami again. The line speed was slightly impaired. This is a shame if you have HBO Go or HBO Now, because you might find the playback of a video pauses occasionally at these speeds. Again, the connection speed was slightly slower with the VPN applied. However, such small variations could be down to irregular service quality from the underlying ISP. Therefore, it should be concluded that the speed difference created by using the Mullvad VPN was negligible. Should I Subscribe to Mullvad? There are more decorative VPNs out there. The inability to switch to different VPN protocols could make the service difficult for Chromebook users or those, such as gamers, who want faster response times. While connected to the Florida server, I tried to get into ABC, NBC, and Netflix to watch streaming video. Of the three, only NBC did not detect the VPN and so I was not able to watch anything on the other two sites. While I was connected to the UK VPN server, I got into the Channel 4 catch up service for E4 and into BBC iPlayer. However, Netflix spotted the VPN and blocked me.